Of all the games that have been released by companies that aren't Treasure, Mega Man X (and maybe X2) have come closest to replicating the feel that makes Treasure games so palatable to the masses. The original Mega Man games had a similar style to Contra except they focused more on the platforming aspect than action.When both companies moved to the SNES era, Konami split their forces to make Contra 3, a true sequel to Contra and Contra: Hard Corps, one of the most balls-to-the-wall action games ever made (the people who made this game went on to form Treasure). 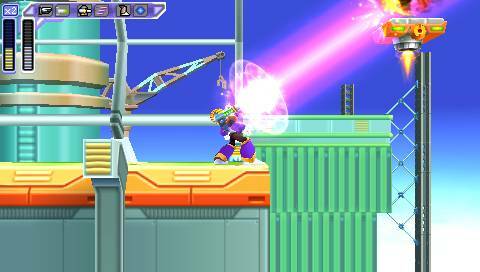 Capcom created a mixture of the two with Mega Man X, a game that's standard platforming fare with a level of creativity that could only be found in Gunstar Heroes at the time. Flashforward about a decade and Capcom release a remake of the original Mega Man titled Powered Up, and a remake of this game called Maverick Hunter X. The most radical change to the game is the physics. Most action games of the SNES/MD era tried to make the combat as smooth as possible, most likely to boast about what the console was capable of graphically rather than trying to emulate a new style of play (only Mecha games like Ranger X or Metal Storm tended to break this mold ). Through a combination of arc trajectory, sound design, movement and a slew of other small touches, Mega Man: Maverick Hunter X is the only Mega Man game ever to replicate what it would be like to be Mega Man in real life. It sounds absurd but think about it. In the NES games, the sprite of Mega Man jumping has one leg in front of the other, cannon armed raised straight ahead and the other arm in the air that's designed to show that you have some form of control of the character during the jumping animation. In Maverick Hunter X the jumping feels natural, graceless even and when Mega Man lands there's a solid thunk of the sound of metal hitting the ground. Along with the overhauled physics engine Maverick Hunter X has all of the usual perks you could expect from a remake. The new 3D models for each enemy look rather nice although they do contrast harshly to the pedestrian backgrounds and the music has also been remixed but it remains largely forgettable in the context of the game, but gets the job done. 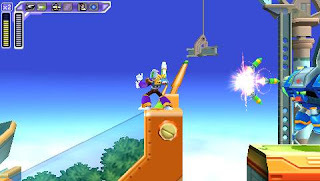 The biggest change to the game is the inclusion of Vile Mode, which allows you to play as the recurring villian of the X series using interchangeable body parts as a weapons system. If this game was based on a graphical tune up then it would be hard to recommend. What really makes this game shine is how it takes the gameplay and changes it with a brand new ruleset through the physics engine and the Vile mode which feels like Phantom Crash Lite. I haven't played Mega Man Powered Up so I can't say which remake I think is better but if you're tired of playing the same eight Mega Man X games then this is proof that Capcom still has new ideas for the series (shame the same can't be said about Megaman Legends 3).